KeyGrabber USB Nano - simply smaller USB hardware keylogger. Miniature version of KeyGrabber Classic USB hardware keylogger. Nano uses same logging engine giving industry's best compatibility and offers most of Classic features. But being only 1-inch long, Nano takes the PC surveillance and security to next stealthiness level - because size matters! Compose your Nano USB hardware keylogger with available features and addons! 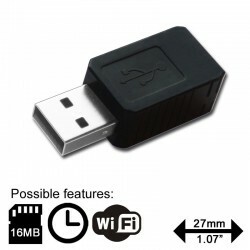 KeyGrabber USB Nano - miniature USB hardware keylogger. The biggest Nano's advantage is size. Significantly smaller than KeyLogger Classic, it's available on the market for over 7 years and sold in nearly 30K units worldwide. 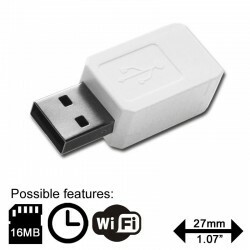 For many years Nano was the industry's smallest hardware keylogger available on the market na till now it's the best combination of size, features and price. Since beginning it's made in the European Union (Poland). In 2018 the entire Nano product line has been refreshed with modern WiFi module, available as an option, offering hi-end remote access features with affordable price. All KeyGrabber Nano USB keyloggers are offering the super fast data retrieve, achieved by switching into USB Flash Drive mode for download as it's a common market standard for good hardware keyloggers. This tiny hardware keylogger is completely transparent for computer operation, no software or drivers required. MCP (MAC Compatibility Pack): extending the keylogger's compatibility by Apple wired USB keyboards support (please see the MAC Logger product page for more details). Please choose the combination you need by composing your own set of requested features as product options can be mixed freely (for example: WiFi + TK + MCP).